Every project can suffer from scope creep. What starts off as a simple project with clearly defined aims can suddenly be off to the races with changing goals, additional features requested, or adjusted timetables. 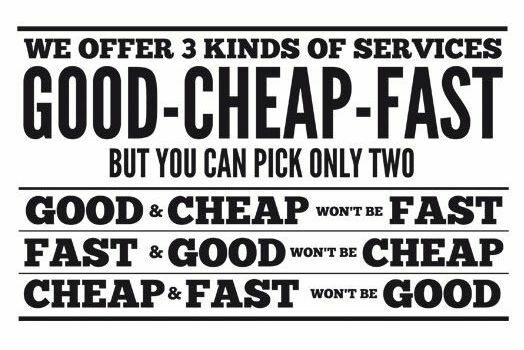 The old adage about quality, speed, and price is already common knowledge with project managers, but when scope creep enters the picture it can be a miracle if any of the three are provided. Avoiding scope creep is crucial for project success. Project managers need to be focused on successful delivery, but if that focus turns into tunnel vision you can find yourself playing catch up with ever-shifting goals and delivery dates. How do you avoid scope creep on a project? With proper planning. The first thing you need to do is ensure there is a clearly defined scope statement. All stakeholders need to be on the same page from the beginning of the project regarding expectations – and those expectations need to be documented. Make sure you understand the vision of the project – and that it’s accurately represented across the multiple planning layers. Avoiding scope creep is best accomplished by designing the project properly at the outset. You also need to have a clearly defined change evaluation process and mechanism in place. If something needs to be changed, there has to be an agreed method of adjusting the process! Your project cannot be successful if anyone can change it – limit who can initiate project changes. Ideally, any kind of deviation should run through the project manager in charge. The project manager is the best informed to know what kinds of changes can be implemented, how, and when. And any potential changes need to be evaluated on those three measures: Can they be implemented? How? When? Be the first one to notice possible changes, and offer them – at a price. A customer who notices a possible add-on will request it. If they do, they will be looking to get it for free, or for a limited price increase. By preempting client, you are the one setting the parameters. As researchers at the Kellogg School of Management at Northwestern University have shown, it’s best to be the first one to make an offer. “This is a potential add-on, and this is what it would cost. Do you want us to include it?” This anchors expectations on price, and avoids an argument about the feature’s inclusion. Avoiding scope creep is easier when you’re managing customer expectations effectively. If there are changes being proposed, get them in writing. The same way the project scope statement should be prepared in written form, and deviations from it need to be documented. This removes any possible confusion, mistaken expectations, or potential scheduling issues down the road. Use a good project management platform. This keeps the project on track. With the variables visually presented at all stages, and the different tasks set and assigned, changes can’t be made. And if there are agreed upon changes, the software should be able to slot them in and rearrange the delivery schedule. Instead of changes derailing the project, they can be absorbed with minimal difficulty and delivered successfully.